Up to this point, we’ve added HTML elements to pages singularly, in that they really had no defined groupings. But most pages are built on “blocks” of content placed in relation to each other. 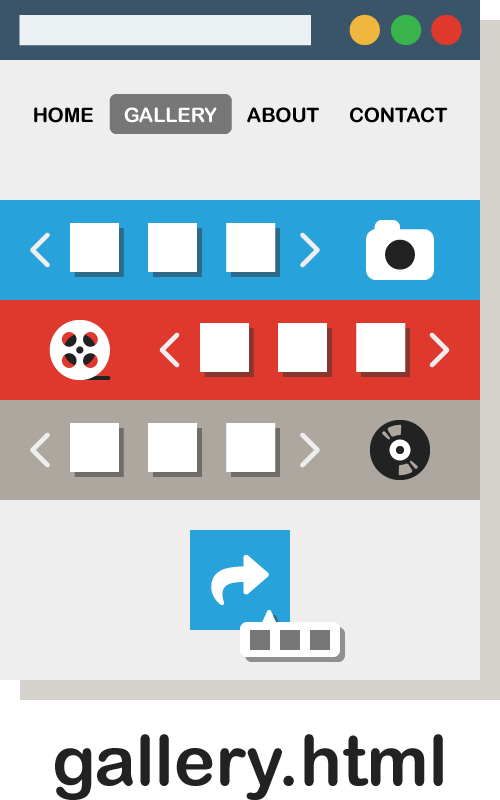 Within each of these areas there is a section for files, a slider (or scrollable gallery) to present those files interactively, and a decorative illustration. These sections, or divisions, help us control how content looks en masse, rather than element-by-element. This will become more apparent as we go on. To describe the examples you’ve been seeing, elements on these pages work much like building “blocks” - separate bricks that come together to create the structure of the page. These elements are primarily given two distinctions; block-level elements take up the full-width of the page, while inline elements do not cause line breaks and can neighbor each other naturally. In the example above, a new type of block-level element was used (the <div>) to section-off a row for each media gallery, which altogether fills the page edge-to-edge. Semantic elements <em>, <b>, etc. In the example above, a new type of inline element was used (the <span>) to create the slider. Since <img> is also an inline element, the illustration can sit on the same block.